This post will focus on the lesser-known variations in the Dallas, TX based company’s sophmore set. 1990 Pro Set is home to a ton of well-documented variations: The New Orleans saints cards with white numbers, cards of Ray Perkins and Johnny Holland are missing their names and position on the reverse, stat errors in the text of Joe Montana’s card #2, etc…all of that info has been recorded in many places online and is usually just a click away. Tonight, I’m going to showcase some of the lesser known variations that can be found in the set. #772 Dexter Manley backwards T. Manley’s card is already one of the most desirable error cards produced in modern trading cards. As of this writing, the last sale was for over $600. For those who don’t know, Manley’s card originally had a message about his suspension from the league due to violating the NFL’s substance abuse policy, to which Manley and his lawyer objected. According to Pro Set, just a handful slipped through before correction. 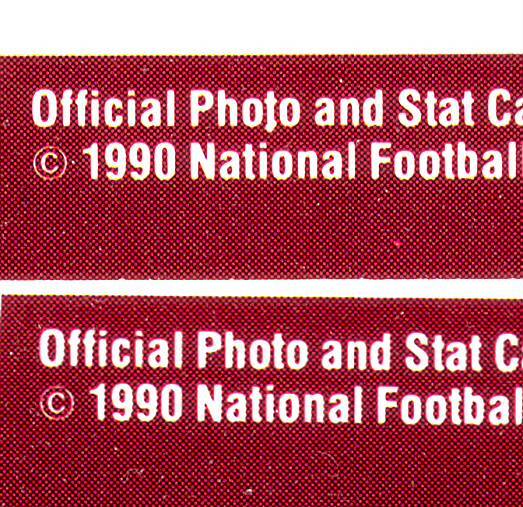 Not a new story in the error card world, but what many people are just finding out, is that a third variety exists: a version of the corrected card where the ‘t’ in “Official card of the NFL” on back (at bottom) looks as though it was printed backwards, or better yet, like a ‘j’ that had it’s top crossed instead of dotted. The backwards t is also present on the original substance abuse version as well, making this card a somewhat difficult “transitional” variety. In the 55 sets I have acquired in pursuit of the ‘substance abuse’ error, I have found just one of these ‘backward t’ errors! 1991 Topps is remembered by most collectors for it’s “1 of every card ever produced” sweepstakes. And most collectors who pursued Topps’ challenge to “find the Mick” in the 1991 packs were very dissappointed to discover that after hundreds or thousands of opened packs, not a single vintage card, or for the extremely lucky among them, a VG 1974 Topps common! 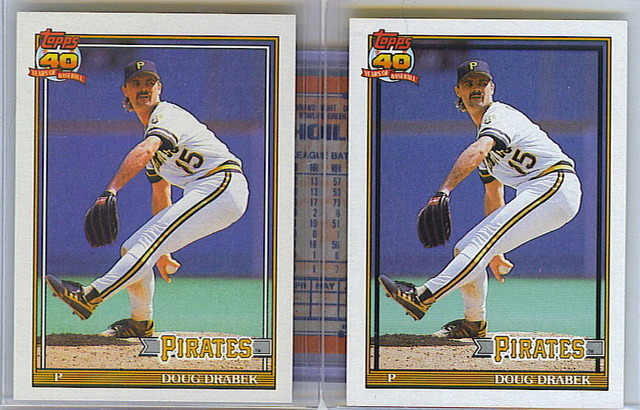 #685 Doug Drabek with WHITE inset border. Probably the most sought-after error in this set, Topps originally printed the card with a white border over his picture instead of the correctly-themed black. Tthis extremely difficult variation is believed to only be found in a limited amount of jumbo packs. Often times, the corrected version appears in boxes that contain the Chris Hoiles variation of similar type. Sales have seen over $100 for this card in previous years! 1990 Bowman Baseball. Shades of Topps Heritage. It took me almost 17 years to notice the approximately 100 different variations found in this set. 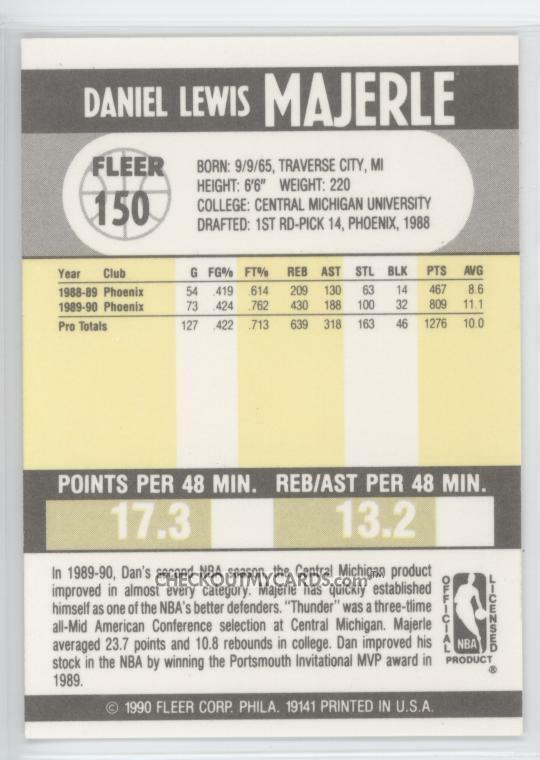 Many longtime collector’s who own an annual price guide already know about the semi-rare, David Segui #251 with his bio information missing on back. This interesting error is the only one like it in the set and currently lists at $3.50, though I’ve seen them sell for much higher and and a little lower at times. But what many collectors don’t yet know of, is that Bowman issued 2 different versions of several of the subjects in this set. Like today’s Topps Heritage line, some of the players can be seen posed against night backgrounds and daytime backgrounds due to some expert airbrushing. Some players sport both gray and white jerseys on their cards and a handful of players had troublesome light posts and clouds airbrushed away in their backgrounds. 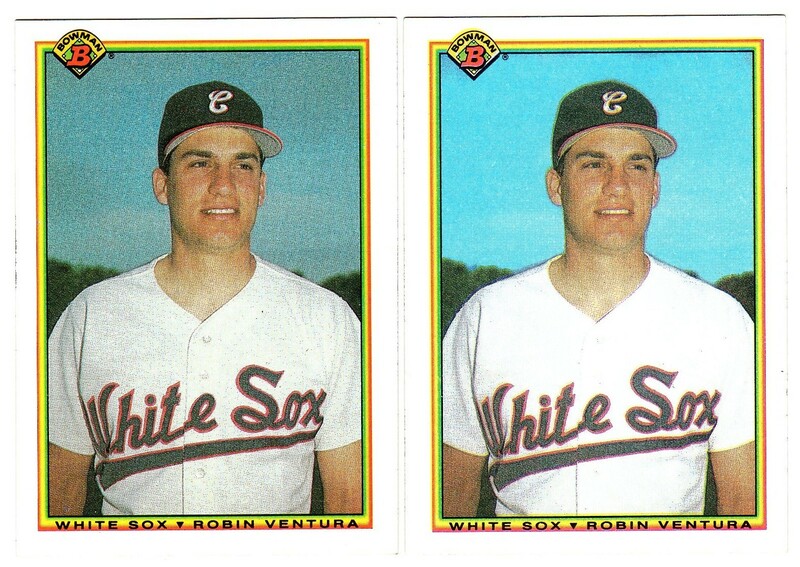 Robin Ventura #311 has had his background and jersey re-touched by Topps’ editors. Hello and welcome to Hidden Gems of the Junk Wax Era! Starting tonight I’ll be blogging about various sets and singles from the “junk years” of sports cards: The (mid) 1980’s and (early) 1990’s. Each post will focus on a specific set, typically one that most collectors today would toss in their commons stash or skim through, pull the one or two key RC’s from and toss the rest. In almost every set from this era of sports card collecting, there are rare, interesting and sometimes valuable error, variation and specialty cards that remain unknown to most, that certainly deserve a place in most collections.